KSR readers, I have not lost my mind…nor my compass. I’m still the tree-hugging, LGBT-embracing, immigrant-welcoming, campaign finance-reforming, pro-choice feminist that you are used to. I still strongly disagree with the Senate Majority Leader on any number of critical policy issues, from Kavanaugh to climate change, from pre-existing conditions to budget-busting tax cuts. But when it comes to hemp, I’ve seen another side of Mitch McConnell. And it makes me feel just a little bit more bullish about our otherwise broken political system. This week, the 2018 Farm Bill became law. Buried within its hundreds of pages is a monumental development: The era of hemp prohibition is now over. Hemp is now permanently removed from the Controlled Substances Act. Non-psychoactive hemp is forever deemed an agricultural commodity, no longer mistaken as a controlled substance, like its crazier cousin, marijuana. By redefining hemp to include its “extracts, cannabinoids and derivatives,” Congress explicitly removed popular hemp products — such as hemp-derived cannabidiol (CBD) — from the purview of the Drug Enforcement Administration. No one is more responsible for this development than Mitch McConnell. He wrote the provision, inserted it within the Farm Bill, fought back an attempt to weaken it in the Senate, and took the unprecedented step of placing himself on the House/Senate conference committee to ensure it remained in the final version. He used all of his power and wile and influence – qualities that I normally lament — to achieve victory for the industry I represent. Congressman Jamie Comer deserves considerable credit for setting the legalization process in motion as Kentucky’s Agriculture Commissioner and then bringing McConnell to the table. Current Commissioner Ryan Quarles deserves due notice for running a successful state pilot program, demonstrating to McConnell the modern value proposition of the crop that ran Kentucky’s agricultural engine in our early history. Senator Rand Paul and Congressmen Thomas Massie and Jon Yarmuth supported legalized hemp long before it was cool. But in the immutable swamp that is Washington, the relatively lightning speed of passage of this complex, nuanced and controversial subject could never have happened without the leadership of the Majority Leader. What’s instructive about the Senator’s laser-like focus on this issue is that it’s in stark contrast to the way many of us Democrats usually think about him — as a political animal solely focused on advancing Republican interests. Perhaps McConnell polled the issue before he began advocating for legalization. But there are no elections to be won by his support, and scant political contributions to be raised. As his staff and former colleagues have insisted to me, McConnell has a sincere desire to assist Kentucky farmers, struggling in the post-tobacco economy, and potentially to build a vibrant new industry back home. Sure, there may be political value, but earning support by doing what’s right for one’s constituents is what politics should be about. I’ve also been deeply impressed – and as a recovering politician, a bit jealous – about the staff he’s assembled. McConnell seems to pick off some of the smartest, most capable and most diligent folks on Capitol Hill and state politics. And they seem to all love their boss. Not in an Obama-2008 dreamy fan-boy kind of way; but rather as a friend, mentor, even sort of a surrogate father — deeply admiring his loyalty, self-discipline and commitment to public service. I won’t be joining the fan club. We are too far apart on too many issues, and I cringe every time McConnell enables the bully in the White House pulpit. But the hemp example proves my stubborn idealistic belief that there’s so much more that Americans agree about than disagree. And the way to start fixing our polarized and paralyzed body politic is to identify that common ground and work toward it together. I was asked a few weeks ago, on KET’s Kentucky Tonight, whether I thought that the federal judiciary would be McConnell’s legacy. I said I hope not. (Long live Justices Ginsburg and Breyer!) 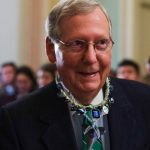 I’m very hopeful instead that a century from now, when the hemp industry has helped transform Kentucky’s economy for the better, we will remember the essential, bi-partisan role played by Mitch McConnell.